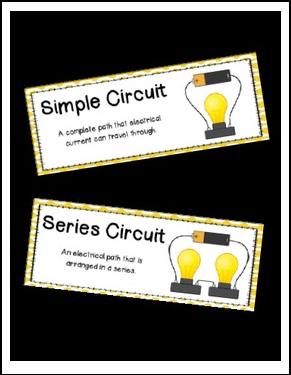 Display four important circuit and electricity concepts using these simple word wall cards. Included in this word wall pack are 4 color cards and 4 black & white versions. These science cards can be displayed on a bulletin board during your circuits and electricity unit, or given to students as a resource. These cards also work perfectly with my Circuits and Electricity Science Notebook Mini Pack. Grab all of my Science Word Walls at a discount with my Science Word Wall Growing Bundle! If you have additional questions, please visit the "Ask a Question" tab in my TpT store.